As promised, Xiaomi has unveiled a brand new smartphone, Redmi 4X today. The launch event took place at Ava Garden, Faletti’s Hotel, Lahore on Friday, hosted by the renowned entertainer and musician Taimur Salahuddin AKA Mooroo. The event also featured performances by Noori , ‘Nescafe Basement’ artist Altamash Sever and special guest presence by Mira Sethi. The phone is an upgrade from the vanilla Redmi 4 in terms of design and performance. There’s not much difference otherwise. It comes with an all metal body and a fingerprint sensor at the back. An IR blaster is included for remote controlling your TVs, ACs and other appliances. On the front is a 5″ 720p (1280 x 720) IPS LCD display. The pixel density for this display is at 293 PPI. Xiaomi Redmi 4X is powered by an octa-core Qualcomm Snapdragon 435 processor which can be classified as a mid-range processor. It comes in 3 different models with 2/3/4 GB RAM and 16/32/64 GB of internal storage. Pakistan will get the 3GB/32GB variant only. A microSD card slot is included with support for up to 128GB of expandable storage. For the OS the Redmi 4X features the same old Android 6.0 Marshmallow albeit with a newer version of MIUI. The skin is quite similar to the iOS interface in Apple phones, but with better customization options and accessibility. For the primary camera, the Redmi 4X employs a 13 MP camera with Phase Detection Autofocus, HDR and an LED flash. At the front you get a 5 MP shooter with beauty mode and other tidbits. One of the best features of this phone is its massive 4,100 mAh battery. Coupled with a small 5″ 720p display and a Snapdragon 435 SoC the battery can easily last you through 3 days of medium usage. Xiaomi has officially unveiled the Redmi 4X in Pakistan and it comes with a price tag of Rs. 18,900. The set’s price should be like 15k-16k. GSMArena said that it’s price is 110 Euro. Bhai khuda ka waasta hai English na likha karo (kam az kam meri kisi post pe reply krte hoe). Mujh jaise Angraizi se nabald shaks ko bhi ghalat lag rhi hai. Next time mistake ko piont out bhi krdounga. Yeah, the price is high here. And I here am waiting for Mi Mix which is still pending approval by PTA. At this price ratio, I suspect Mix’s price would be around 60K? This is sold unofficially by Ishopping just like many others. Mi Mix is still pending approval by PTA as I have checked with the official sources and hence buying from these guys would be nothing but illegal. 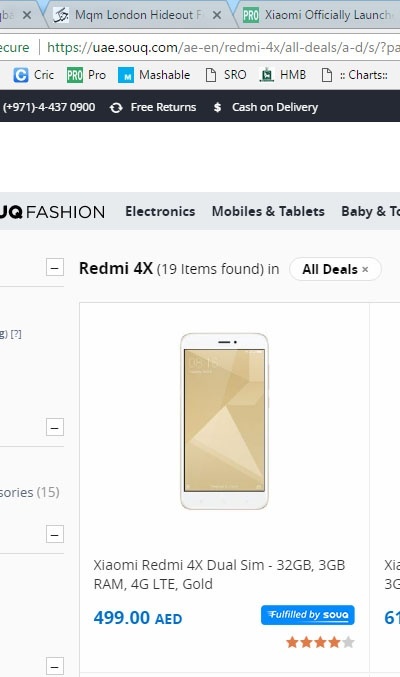 what Redmi Note 4 is around 21k why should one buy this set ??? Its not but Snapdragon 435 in particular is different. its an octa core A53 SoC which is similar to what a lot of other smartphone companies offer in this price range. so? does it make it mid range? so at the end it’s still not a mid range chip. still it isn’t mid range chip. yes it is. Otherwise you wouldn’t see mid-rangers costing 30-40k using it. making something better does’t make it jump grades. ,? today’s 6xx my work better in few things compared to older 80x, that doesn’t make them top of the line. Well first of all, classing something as 2xx,4xx does not represent it. Manufacturer only named the series, it did not name its series low-end, midrange etc. Secondly, low end and entry level are the same thing. These days its upper midrange and lower midrange apart from entry level and flagships. Fourth, 430,435, 625,626 have the same processing units with different clock frequencies and both chips offer similar performance. Check benchmarks especially GPU ones. why are arguing? a simple search or visiting Qualcomm should clear your doubts. why manufacturer uses what series in what mobile……. seriously you want me to answer that? I would have preferred to see you reply to my points in the previous comment. You should try googling it yourself, (btw visiting Qualcomm wouldn’t resolve your misunderstanding). These are some of the phones with a 430/435. Look like entry level phones to you? None of them is priced below $150 and they go all the way up to $350. Arguing is futile if you can’t admit you were wrong and can’t show positive attitude. the last line you wrote, i 100% agree to it. try it is not that hard. I have informed you with the correct information. If you fail to understand than you are either a troll or …let’s not go there. Not the mid range so please launch in mid range. I guess They are focusing on Newly launched cheaper models right now. Mi series maybe launched in 3rd phase starting after two months. Price is high.It should be around 15-16K. You just have to spend 2k more and get Redmi Note 4 which is a better buy than this! Black Friday me bi itne ka hi hga. Us s phle 36000 ka krdygain phr bolygain 50% percent off. Then Daraz and other awesome online shopping websites will claim they got so much profit through … sale. its just slight upgrade from redmi 4a which is already selling expensive price of 13k. Why is this priced at 19k? LG phones have weak solder, boot loops are very common. G4 bootloops problems are very common. You are rightly pointing out. LG phones have problems since Optimus 2x. I never bought LG phone after that. Even g5 has that problem. search on the internet. v10 also suffers from that so does the g5. About G6 only has assured it wont be happening but you cant deny it wont happen as LG is always worse in quality and they force users to buy a new phone every year. Bootloop was due to lead free solder which breaks at high temperatures. xiaomi is much cheaper and better than LG phones being sold in Pakistan. Most of these phones were stolen in western countries then shipped to China for refurbishment in underground factories then exported world over. read comment on website like aliexpress about lg , htc and others. Did you updated your phone? Which version of LG g5 u have? American? I m using LG G5 H830 (T-mobile).You can unlocked bootloader only h850(International Version) and T-mobile. Other variant bootloader currently not yet available . Thanks for the explanation… I always prefer international then Tmobile…. At&t always locked down bootloader…. Am using Axon 7… It’s amazing…..
Bhai own nahe karte aur kahte ho fix ho gaya. U cant fix it with software. It is hardware issue due to lead free solder. Xda has complaints about that issue still. LG is also sued in America for boot loops. It has more to do with memory chips than processor. Hardware faults dont get fixed via software updates. I already checked and looked on google….. U Check the definition of bootloop. Which phone are you using now? Like this phone, but will wait few weeks/months. By that time, they might get price reduction or may include Internet bundles, Easy paisa discounts. please launch Redmi 4 Prime also. Is se acha le max 2 ha. If you change the Color to black, the price is close to what is being offered here. Boot into recovery and delete data and cache. Try to on without battery with wire DC current in repair shop. Its showed some valtage on screen its hard to attached the pins bcz the box where the battery give power is too small and its hard to attached two pins well first its show some vatlage and later in second try no response. I tried serval more tries but no response anymore. One plus one… Or ZTE…. They are better then any other Chinese phones….. Price to performance ratio and build quality….